We Are So Much More Than Just A Feed Store! Repels house, stable, face, and horn flies. Effective for hours. For use on horses, ponies and dogs.Protects against biting and nuisance flies. 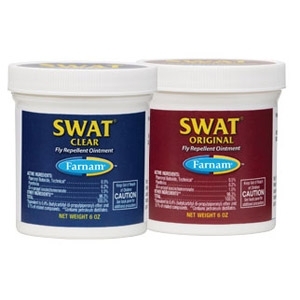 Formulated for use around wounds, sores, scratches and abraisons, SWAT® ointment is your go-to solution. Ideal for use on sensitive, hard-to-reach areas. Available in Original Pink or Clear Formula; 6 oz. jar. © 2019 Hanson Grain . All rights reserved.